Plenty of dead fish washed ashore the first week of August due to red tide, but it didn’t kill commercial fishing in Cortez. Karen Bell of A.P. 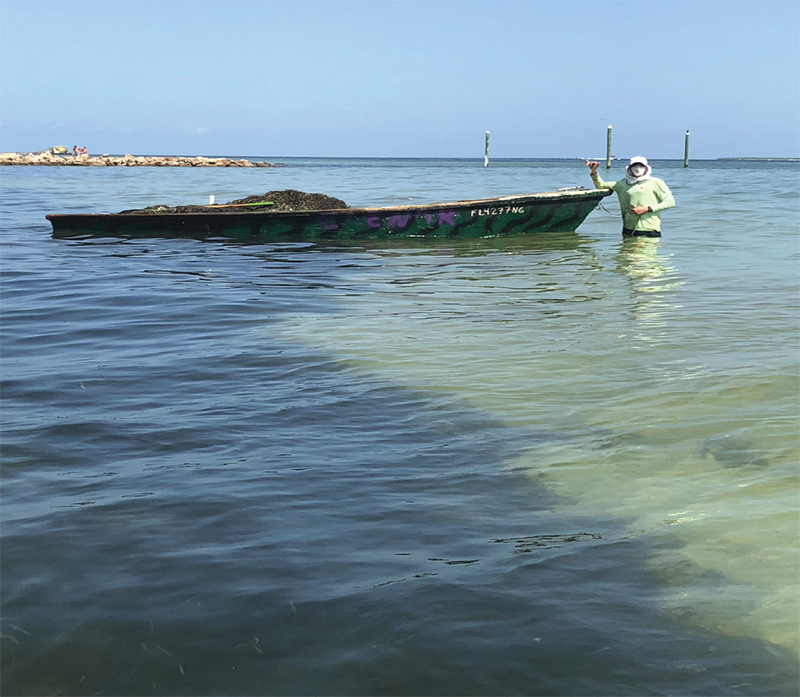 Bell Fish Co., at an Aug. 6 Florida Institute of Saltwater Heritage meeting, said impacts had been minimal, but it was too early to tell if the toxic algal bloom would slow business. 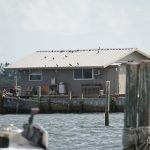 Bell said red tide killed some inshore fish, predominantly baitfish and mullet, but offshore fishing — mostly grouper and snapper — remained unscathed as of Aug. 6. The biggest impacts on the industry were felt to the south, she added. Bell said she received a call from a Georgia-based buyer looking for mullet who doesn’t normally buy from A.P. Bell, which indicated to her other fish houses were feeling the pinch. It is, however, the slow season for mullet. Mullet fishing peaks in November and December, when the temperatures cool and the fish spawn. She also said fishers were reporting they saw fish struggling to breathe at the water’s surface, indicative of red tide symptoms. The bloom attacks their central nervous systems. “What it hasn’t killed, it ran out of the area as far as fish go,” said fisher Nathan Meschelle. Meschelle said he went fishing Aug. 6, but after the day on the water produced a light haul, he shifted gears. He contacted Manatee County Commissioner Carol Whitmore to ask if he could work cleaning up fish instead of catching them. 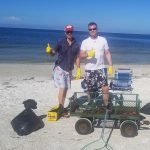 Meschelle said Whitmore contacted the island cities’ mayors and, Aug. 8-9, he worked alongside Anna Maria public works employees scooping rotting carcasses into his fishing skiff. “We thought it was going to be worse. I was concerned. I still am. It’s only been a week. If it turns into a couple months, I would be suffering a loss,” said Meschelle. For fishers like Meschelle, red tide is one of many factors that impact the fickle industry of commercial fishing. Meschelle said when the fishing isn’t good, he works on boats. Or, in this case, works for the city cleaning up dead fish. The fish kill isn’t all bad, he added. Similar to the benefits of a forest fire, he said the red tide culls the fish stocks of weaker, diseased fish while the stronger ones go on to reproduce. And the fish carcasses left behind fall to the bottom feeding crabs and shrimp. For now, fishers are waiting. “We’ll have to see what next week brings. 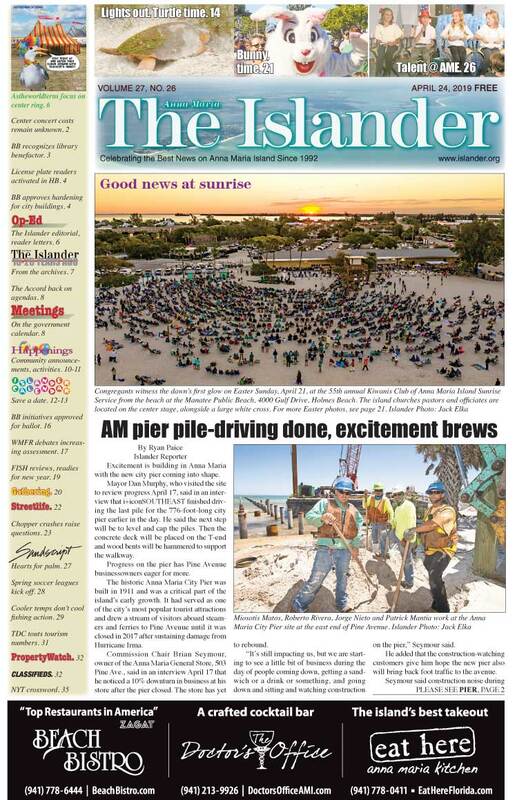 Maybe we’ll be fishing or maybe we’ll be out cleaning up,” Meschelle said.